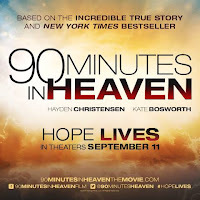 On September 11, 2015, a new faith-based movie, "90 Minutes in Heaven," will be opening in theaters around the country. 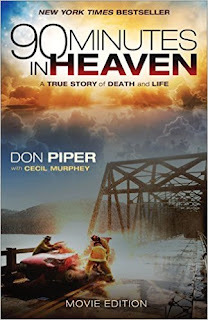 THE MOVIE is based on a book by Pastor Don Piper (a young Baptist Minister), who was declared dead in 1989 when a semi truck crushed his car. Don's body lay under a tarp for the next 90 minutes, but Don says his soul was alive and well in Heaven during that time. It was considered a miracle when another Pastor prayed for Don at the accident scene and Don was revived. However, Don wished he had never been brought back to Earth. The beauty and joy of Heaven was replaced by excruciating pain - both physical and emotional. It took the support and prayers of his wife, their three children, and many friends, to help Don hold onto his faith while he fought through a very long recovery process. The movie is presented by GIVING FILMS, and is rated PG-13 (for intense accident and injury images). 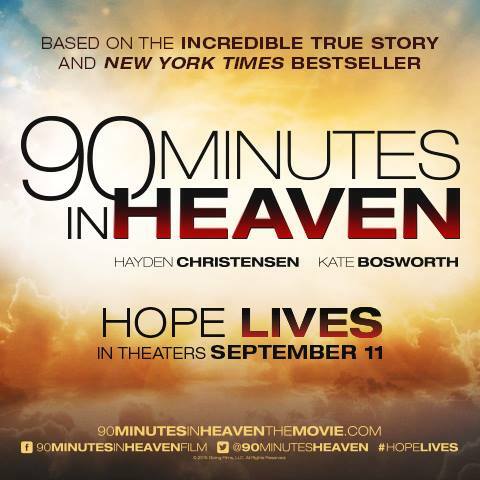 It stars Hayden Christensen, Kate Bosworth, Michael W. Smith, Fred Thompson, Dwight Yoakam, and Jason Kennedy. CLICK HERE TO WATCH THE OFFICIAL TRAILER. I received a copy of the new movie edition of the book and it was VERY interesting to read, especially his description of what Heaven was like. 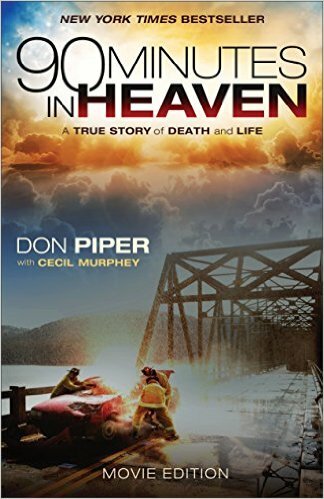 However, don't let the title fool you, as there are only 2 chapters that fully talk about Piper's time in Heaven. The rest of the book focuses on his long, painful recovery, the depression he encountered, the prayers of others that helped him through, and the testimonies of many who have been encouraged by Piper's story. It is obvious that Piper's experiences have been a huge ministry tool to help bring others closer to the Lord. My only disappointment is that I could not find a clear Gospel message presented in the book. Several proclaim they have accepted Christ as their Savior in response to Piper's testimony, and that is excellent to hear; but I'm sure there are many readers who could benefit from a deeper explanation. Piper does, however, include a Gospel message on his ministry website: DON PIPER MINISTRIES. And, the address link can be found at the end of the book. If interested, YOU also have a chance to win a copy of this book, just by entering the drawing below. Giveaway ends Saturday, September 12, 2015, at 8:00 p.m. CST.